Mandating the use of fossil fuels for energy production seems to deeply contradict the ideals that many Victorian communities hold. Limiting the potential of clean energy production seems to be a world first as no other country has wound back a renewable energy target, as Ketan Joshi writes. This article was published in the Blog Some Air. The article can be found here. In recent months, I’ve found my phone, chirping incessantly to draw me from my slumber, packed early with 140-character-nuggets of really annoying or depressing news, hurling into my brain on the conveyor belt of snippets in the Twitter app. Usually, things like “a politician finds wind farms “yucky” or “person says solar panels are only for rich people, despite all the data everywhere saying they’re”not” – things not advantageous for the future of renewable energy in Australia, essentially. 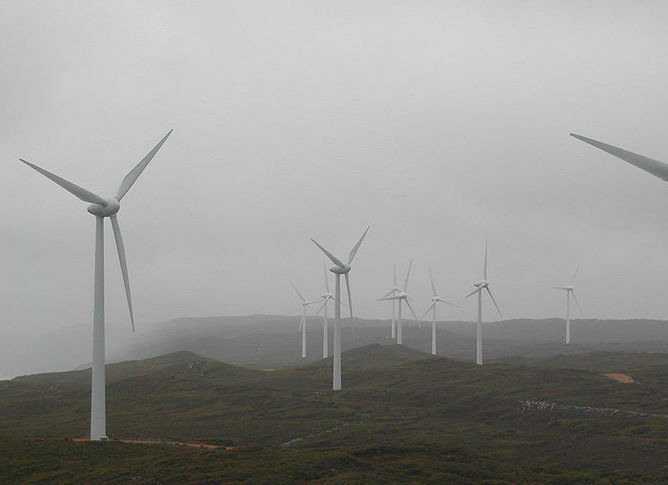 Lately, these nuggets of bad news have centered around Australia’s Renewable Energy Target. The legislation has always mandated an absolute renewable energy component of 41,000 gigawatt hours – at the time it was written, that happened to be 20% of demand forecasts in 2020, so that was used as the slogan. 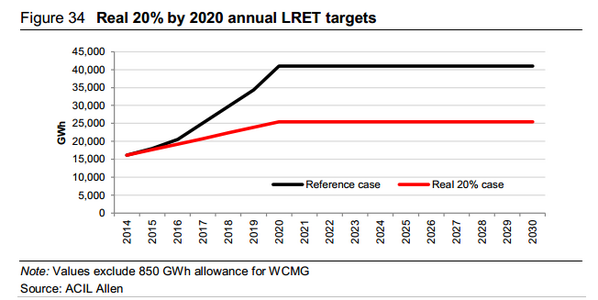 Demand forecasts have fallen since then, and so the government wants the renewable energy target to follow demand forecasts – a so called ‘Real 20%’. This will mean that legislation that exists to create certainty for renewable energy investment will necessarily incorporate the uncertainty you get from demand forecasts. This neuters the very thing the RET is meant to do. You can’t attach wheel clamps to a car and claim it’s an improvement. Commentary on these pronounced intentions has simmered at the edges of media and specialist climate publications, in addition to a spike of coverage on the day it was announced. It’s all good stuff, but there are two points I’ve not yet seen addressed. They’re important points, I think. The most important component of the recent announcement from the government is the intent from the leaders of a country to create a percentage maximum for clean technology penetration in the grid. This clean energy ceiling is a world first. No other country has wound back a renewable energy target, and no other country has imposed a mandatory limitation on the percentage of clean energy in their electricity grid. It’s not just a cut to the renewable energy target. It’s the weird imposition of a limit on technology that generates electricity more safely, and more sustainably, than the current technology. That’s insane. The logical follow-through of a maximum is the inverse: an 80% minimum supply of fossil fuel-powered energy on the electricity market. That the government actively wants a minimum of 80% fossil fuels in the market fills me with a weird sense of dread. 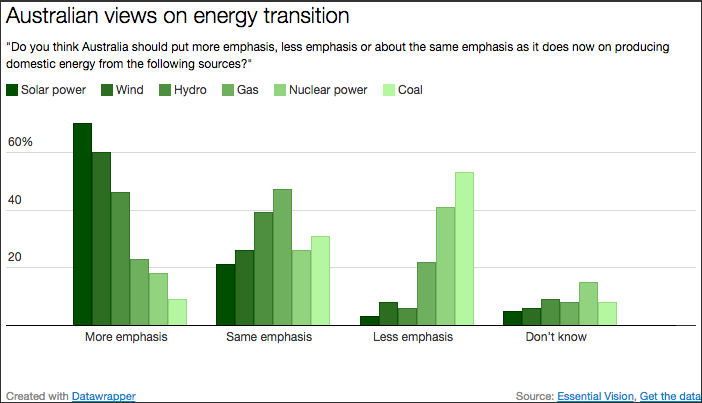 The risks of burning fossil fuels to produce electricity are no longer controversial. To mandate their presence when they’ve long passed their use-by date is….terrible. They’re deeply unpopular, too. This won’t sit well with the electorate. It hurts me to say this, but I wish my news feed had been a little harder to digest on the morning of the government’s announced intent. It’s one day those nuggets of news should have filled us with genuine dread. The world’s first renewable energy limit.